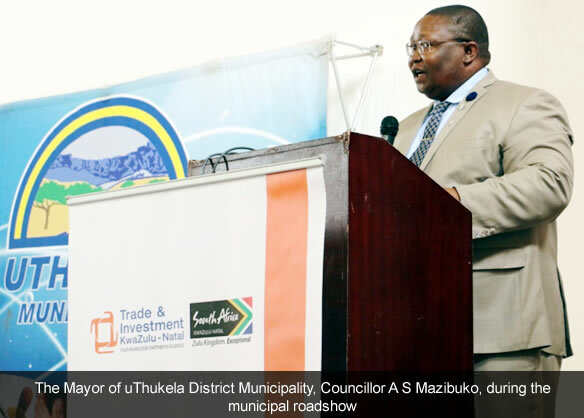 A forum to unlock investment opportunities across KwaZulu-Natal and provide regional traders and business owners with a unique opportunity to develop and sustain their businesses was made possible through the uThukela Municipal Roadshow this week. Trade and Investment KwaZulu-Natal (TIKZN) in partnership with the Department of Economic Development, Tourism and Environmental Affairs; Tourism KwaZulu-Natal; and the uThukela District Municipality hosted the fourth municipal roadshow at Ladysmith Town Hall on 9 November 2017. The objectives of the roadshow are to improve the quality of awareness of TIKZNs services; update the business community on tourism and investment projects; share the planned provincial enterprise development and marketing initiatives; contribute to economic growth and job creation by facilitating access to essential economic information in all parts of the province and strengthen relationships and the flow of communication between TIKZN and municipalities. In so doing, the roadshow demonstrates TIKZNs commitment to partnering with all spheres of government through a forum which enables corporate members to network across business and government and promotes regular engagement with district municipalities and other top-level business leaders. TIKZN is a South African trade and inward investment promotion agency, established to promote KZN as an investment destination and to facilitate trade by assisting local companies to access international markets. The organisation identifies, develops and packages investment opportunities in KZN; provides a professional service to all clientele; brands and markets KZN as an investment destination; retains and expands trade and export activities and links opportunities to the developmental needs of the KZN community. This particular roadshow seeks to promote uThukela district as an investment and trade destination and strengthen relationships and flow of communication between TIKZN, as the provincial investment promotion agency, and Tourism KwaZulu-Natal as a provincial tourism agency, uThukela District Municipality and the Chambers of Commerce within the district. One of the prominent Business Chambers represented at the roadshow to demonstrate their support for this worthwhile initiative was the Ladysmith Chamber of Commerce of Industry. The Honourable Mayor, Cllr A S Mazibuko, said: As uThukela District we are excited about this gathering which allows us to share ideas for the beneficiation of our community. We appreciate the efforts of TIKZN which will bear fruit and stimulate our economy. As a district, we are working collectively to deal with issues of economic development and will assist officials responsible for stimulating economic development to strategize and drive the concept of radical economic transformation. Speaking on behalf of Tourism KwaZulu-Natal, Bongani Mthiyane, General Manager for Marketing emphasised the importance of channelling the tourist influx, not only to Durban, but to other parts of the province as well. Due to the economic situation that we are in, research has revealed that holidays have become shorter as opposed to the past. The district has all the resources, but we just need to hit the ground running. We need to stop working in silos - our strength lies in us working together. We want to assure our communities that we are now going to aggressively ensure commercial localisation which will benefit our community. Cllr Mazibuko concluded by thanking TIKZN for driving economic growth. uThukela District Municipality is predominately rural and characterised by poor socio-economic indicators such as a low revenue base, poor infrastructure, limited access to services and a low economic base. The main economic sectors in the region include manufacturing (21%), wholesale and retail trade, catering and accommodation (17%), finance, insurance, real estate and business services (15%).